Stanley Kubrick's "2001: A Space Odyssey" was a movie sensation in 1968. Over one-half billion TV viewers watched NASA's Apollo 11 conduct the first successful moon landing in 1969. 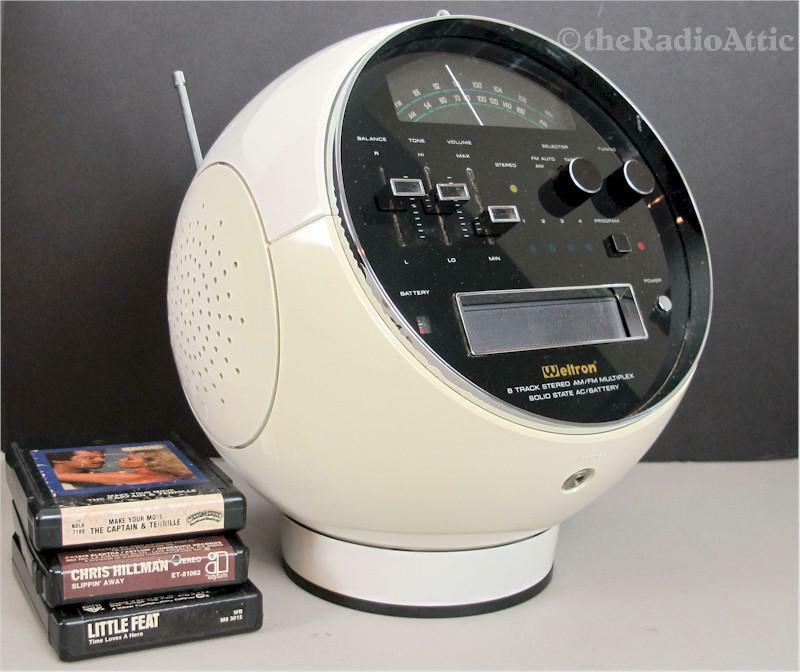 In response, Weltron brilliantly designed an AM, FM, 8-Track set that resembled an astronaut's helmet! Everyone, including myself, wanted one of these modern music machines on their desk. Not a gimmick, they were excellent performing radios and everybody was demanding an 8-Track tape player for home use. As a poor student, I couldn't afford one but I did buy this outstanding example about 15 years ago from a fellow collector. It plays and sounds great on AM and FM. Even the 8-Track tape player works! And, the buyer will receive these 8-Track tapes with their purchase: The Captain & Tennile, Chris Hillman and Little Feat. It operates on AC power or batteries. 12-1/2"H x 10-1/2"W x 10-1/2"D; 13 pounds.